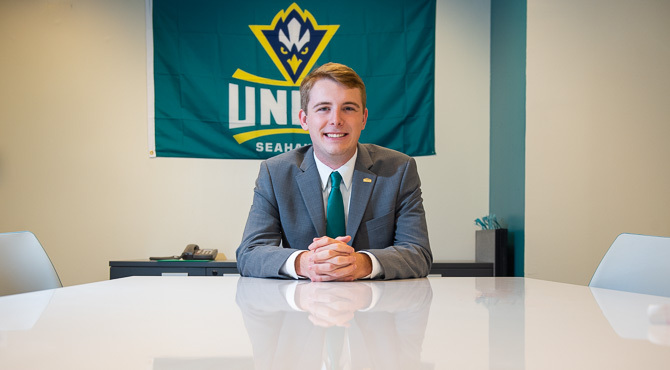 Cole Tillett ’20 sees his role as student body president as an opportunity to learn valuable life lessons and have experiences that will stay with him beyond his time at UNCW. Tillett, a business administration major and an Emmett and Gladys Corbett Scholarship recipient, aspires to continue a career of public service by becoming a teacher or a member of local or state government. He is involved in the Honors College, student government and Beta Gamma Sigma Honor Society. He previously served as the Student Honors Advisory Committee vice president, Historical Society vice president, UNCWeekends operations facilitator, Swingin’ Seahawks Dance Club executive member and an Honors mentor.